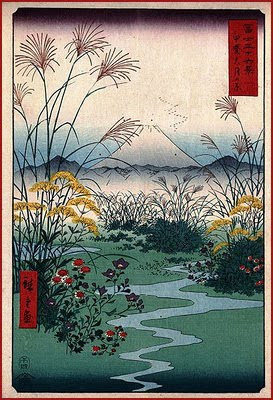 The seven grasses of autumn were often mentioned in verses of the Manyoshu, the earliest collection of Japanese poetry and song. Images of autumn grasses in a later anthology of court poetry, the Kokinshu, illustrate the culture of Heian Japan [784 - 1185] in a way that could not be captured by painting. Powerful and concise language draws out the subtle nuances of life and love at the time, just as nature and flowers invoke the mutable seasons of interior emotion. The capacity of the autumn grasses for inspiring deep emotion among people in olden days may be viewed through their composite nature of beauty tinged with sadness. More than flowers of any other season, autumn grasses washed by rain and bent in the wind attain a beauty unsurpassed, and this is the beauty of flowers for the tea ceremony. CLICK here for more ENGLISH information! The common theme of these seven flowers is the ""the pathos of things", also translated as "an empathy toward things" or "a pity toward things" (mono no aware 物の哀れ). The chrysanthemum is notably absent in this flower collection. But the chrysanthemum has its own festival on the ninth day of the ninth month, Choyo no sekku. 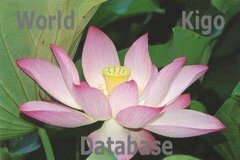 Just using the word "arrowroot (kuzu)" in haiku refers to the leaves of the plant, which are white at the backside and theme of many poems since olden times. Arrowroot is very strong and lively, the violet flowers stand up between the leaves and are full of power. A person like a kuzu, "ningen no kuzu" means "human garbage". The first green leaves of the plant are still rounded. OMINA means "Woman (onna)" and the yellow flowers remind the Japanese of sweet chestnuts cooked with rice (kuri gohan) .. eshi ... meshi ..
On a long stem there are small yellow flowers and we can enjoy them swaying in the wind. These flowers are rather feminin and gentle in their poetic feeling. When written in hiragana, this feeling is felt double. The flower has been a favorite in Heian court poetry. for that alone I plucked you. I have fallen from my vows.
. Soojoo Henjoo 僧正遍照 Sojo Henjo . Daruma san だるま　さん ! and the courtesans of the Yoshiwara quarters. otoko eshi 男郎花, which has white flowers and a thick stem. The stem can be more than one meter long. The flowers can be pinkish or white. The flowers resemble a person dressed in a formal Japanese trouser (hakama), hence the name (bakama .. hakama). This flower also has been the theme of many waka poems of elegance and beauty. Its color fades with the deepening of autumn. It has a faint smell which gets stronger if you break the stem.
. Morning-Glory (asagao 朝顔) Convolvulaceae family. . The pronounciation in Japanese can also be: kichikau　きちかう, kichikou　きちこう. She flowers in places with a lot of sunshine. Her color is especially beautiful. There are also white flowering plants. She flowers in the harsh climate of the mountain ranges in Hokkaido and the Chishima Islands in the north of Japan. When he was making the decision to leave Iga Ueno for Edo. This hokku is from lunar 8/7 (mid-September) of 1810, when Issa was in Edo, where the elite sumo wrestlers competed. The first line almost surely has six syllables, since sumou has a long 'o' in Japanese, as indicated by the editors of Issa's diary in the complete works (3.75) and by Maruyama Kazuhiko, who separately edited Issa's Seventh Diary and his selected hokku. And Issa is not averse to "long" six-syllable first lines. In referring to the wrestler, Issa uses the polite second-person pronoun nanji, presumably because of his high status within the sport as a top wrestler. However, nanji wasn't as stilted as "thy" sounds in English. In a later variation Issa uses the neutral sonata for "you." Did he feel it was more intimate and showed the common humanity he shares with the wrestler? What is often romantically translated into English as "maiden flower" is literally "woman flower," since omina refers to a mature woman, often an older woman. This autumn-blooming meadow plant has clusters of small yellow flowers standing at the top of long, elegant stalks, and the folk etymology of the plant name is that the way the long stalks bend and sway in the wind suggests something female to males. In Issa's hokku, he may be symbolically offering a stalk of the flowers to the wrestler, or he may be telling the wrestler that these woman flowers are "yours" because they are like him and best express the self-image the wrestler is unconsciously projecting to Issa. In either case, it seems to be the thin, unmuscular, delicate quality of the flowers that causes Issa to want to give some of the flowers to the big, corpulent, muscular wrestler. Issa usually sympathizes with losing wrestlers more than with the winners, and he likes to point out situations in which the apparently invulnerable wrestlers show vulnerability or unexpected sensitivity. In the present hokku he may be addressing the soul of the wrestler and saying that he knows the wrestler has a very sensitive part inside the armor-like male body that he has built up. In another hokku Issa mentions a wrestler with a stalk of flowers stuck in his topknot, so he may be wishing the wrestler in the above hokku would show his other side and wear woman flowers in his hair. Is Issa engaged in gender bending? I don't know, but he was familiar with the Yi Jing and with yin-yang philosophy, and that means he was familiar with the basic principle that extreme yin turns into yang and extreme yang turns into yin, and he may feel the sumo wrestler embodies an extreme yang position. The hokku before this one in Issa's diary also associates a sumo wrestler with a delicate flower that is very sensitive to light and to its surroundings -- a morning glory.
. Sumo wrestling　相撲　. This hokku was written in the 8th month (September) of 1812, while Issa was still based in Edo but was on a short trip back to his hometown to prepare for moving back there. In the hokku Issa seems to be flirting with and teasing a woman flower beside a path somewhere. There is a long tradition in Japanese poetry of addressing woman flowers as if they were human women, one that goes back in the early days of waka, when womina (not cognate with English 'woman') meant "beautiful woman," but by Issa's time the pronunciation was omina, and it referred to any grown woman. It is often translated as "maiden flower," but there was another word for girl or young woman: ominago. In autumn the tiny bright yellow flowers of the bush grow in wide clusters at the top of long, tall stalks that curve gracefully when they bend in the wind, and the stalk is rather thick, allowing it to bend far and sinuously. The strong yellow of the flowers almost equals that of spring rapeseed blossoms, but the flower clusters are diaphanous and more delicate. Issa addresses the flower (actually a cluster of tiny flowers) with mock solemnity and outrage, telling "her" that, as everyone knows, the samurai authorities have instituted laws against the kind of bending and curving she is doing outside in broad daylight. Does she think she can brazenly ignore the law and sinuously bend and sway right beside a public road? Issa no doubt refers to numerous laws and injunctions, beginning with the outlawing of female Kabuki troupes in 1629, that made it a crime for women to perform in public or wear stylish or provocative robes in public. The obvious irony saturating Issa's pompous warning of course strengthens the compliment Issa is paying to the flower and to the eye-catching way the stalk and flower move in the breeze. Issa also seems to be parodying the various laws themselves by claiming they apply even to flowers. This hokku seems to be still another oblique criticism by Issa of the authoritarian and highly patriarchal samurai ruling class.
. Comment by Chris Drake . ***** . kanokosoo 纈草 (かのこそう) Valeriana officinalis . Susumu Takiguchi assisted in the translation of this haiku. He points out that guns were "brought to Japan for the first time by the shipwrecked Portuguese in 1543 (some say 1542), and revolutionised the way battles were fought and castles were designed. They were initially 'hinawa-ju' (matchlock or firelock) and this must be the type of 'teppo' which Issa was talking about." Shinji Ogawa believes that this haiku might allude to Issa's first wife, Kiku. The Besshi copper mine (別子銅山 Besshi dōzan). Flipped over by the wind before. First frost of the year! The broad kudzu leaves attached to the vine are easily blown around by the wind and Japanese poets have been writing about them for centuries. Bashō wrote a haiku about noticing the frost on the front of the leaves and Buson is noticing it on the leaves that have been turned upside by the wind. Another example of the different positional kind of perception that Buson was able to look at the world with. of Lady Kuzunoha . . .
kuzunoha in Haiku is often used implying the feeling of a grudge, bitterness and resentment. The light rain here represents the tears of Lady Kuznoha when leaving her baby behind, because her husband found out she was a fox. "decorated with kuzu 葛 arrowroot "